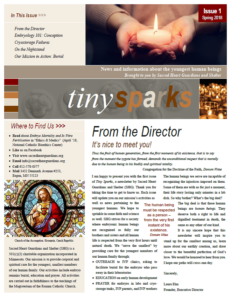 Sacred Heart Guardians and Shelter issues our newsletter – Tiny Sparks – two times per year. We hope you find it interesting and educational. 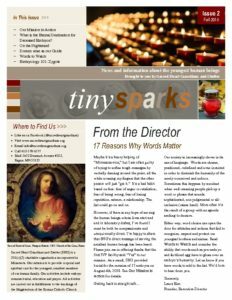 Each issue provides updates on our mission’s activities, as well as current events affecting our embryonic brothers and sisters. You’ll also find bits of science and faith to support you along your journey. Click on the image to access the full newsletter.